I've always been a gin drinker, choosing gin over anything else way before the revolution hit, which is why I was pleased when the revolution did hit - and brought with it a plethora of innovative new gin inspired ideas and infused cocktails. It turns out gin has a lot more to offer me than my usual tonic with a slice of lime or the occasional holiday Gin Fizz. 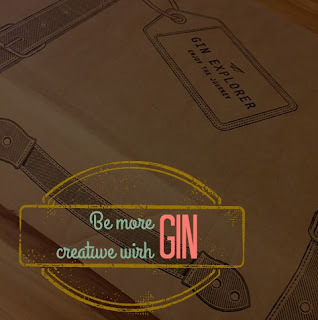 When Gin Explorer got in touch it seemed positively serendipitous. They challenged me to come up with some reasons why I enjoy gin so much and create a new year's resolution inspired by my favourite tipple. In return, they sent out one of their fabulous Gin Explorer Subscription Boxes for me to share with you all. Subscription boxes are a brilliant way to explore brands you might not normal buy, or new ways to enjoy your favourite thing. Be it makeup, organic veg or....gin and you won't even need to leave the house to get started! Delivered by UPS - in full army inspired regalia - I was delighted to receive my box, once I ascertained I wasn't in any trouble with the law, and discover its contents. 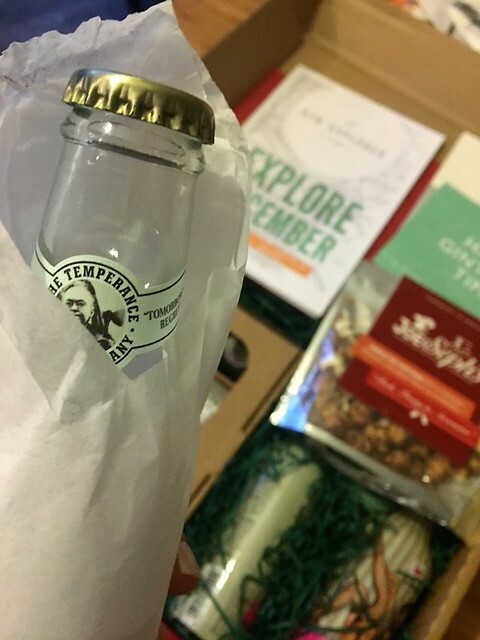 The luggage themed box itself contained; 4 x 50ml flavoured gins, 2 x retro bottles of mixer, 1 x mixer and a key ring bottle opener for the intrepid gin seeker. 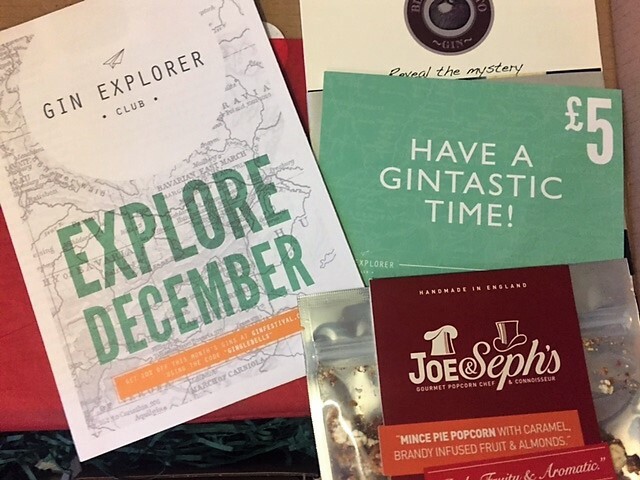 As well as information on the drinks contained within and some delicious mince pie flavoured popcorn from Josephs. 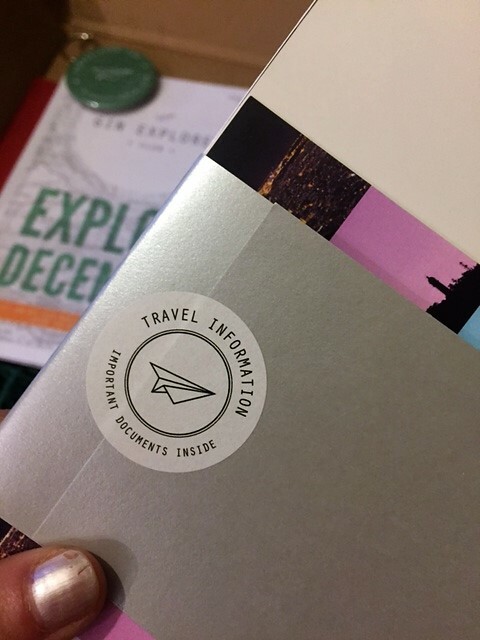 I was completely blown away by the quality of this subscription box - having been let down by similar services in the past. For £24.99 a month, think this is the ideal gift for the gin lover in your life (hi friend!) or anyone who wants to expand their gin horizons for 2017. To make most of the classic cocktails out there, gin, unlike spirits such as vodka or rum, is intended to be used in cocktails. The delicate flavours and hints only become apparent once you’ve treated yourself to something a little fancier, darling. Which leads me nicely onto number 2.
Who, unlike James Bond, knows exactly how to make a proper martini - with gin. Once again proving my life mantra of ‘What would Lorelai Gilmore do?’ a sound one. Believe it or not the internet makes many claims regarding the health benefits of gin. Traditionally drunk by sailors to help fend off scurvy, possibly even invented to make quinine (a natural preventative and cure for malaria) more palatable and packed full of antitoxins - providing you’re drinking gin of the barreled persuasion. Whatever the truth, it sure makes ordering your 4th G&T of the evening, a lot easier to swallow. People drink and enjoy gin all around the world, with it first being distilled in Holland before becoming the quintessentially British spirit of choice. Nowadays it is most often enjoyed in the Philippines – but I’m sure we gave them a run for their money over the festive season. Not only that, but its easily customisable flavour makes for a drink which can be adapted to suit any country or culture. If you don’t remember this advert, then I’m about to change your life. Never mind John Lewis, back in 2012 it was Aldi cranking out the very best in Christmas advertising entertainment. I won’t say any more than that for fear of spoilers, but you can check it out here. In fairness, the perseverance of those living in America during prohibition, ensured that none of our favourite alcoholic drinks were left behind, but I give particular credit to the survival of gin because of the reportedly disgusting taste of the innovative (if a little lacking in refinement) bath tub gin. The term bath tub gin conjures an image of Miss Hannigan, from the original Annie movie, drunkenly concocting her own homemade brew in the bathtub - and if that doesn’t make you smile, you’re probably dead inside. It’s in June each year - and any excuse to spend an entire day drowning in gin, is bound to put a spring in my step. To explore gin a little further yourself, click here to pick up £5 off your first order by using the code TAKEOFF - and don't forget to let me know all about the fabulous things you find in your box! And my gin inspired resolution?